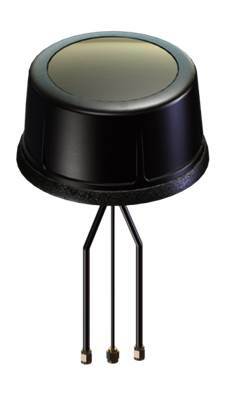 The Laird vehicular 3-port antenna consists of multiple radiators under a single housing. It can be configured for use in 802.11n or multiband SISO applications. Configured with ports that can cover 698-960 / 1710-2700 MHz, 2300-2700 / 4900-5900 MHz and GPS (1575.42 MHz) allowing for MIMO/SISO and/or Navigation/Location opportunities within the same antenna. Connector options include SMA male connectors for 3G/4G LTE and GPS ports with an RPSMA male connector for the WiFi ports. The housing incorporates a low-profile, rugged design that meets IP67 standards. The antenna also features high impact, UV-resistant polycarbonate plastic available in black or white.